Consumers are demanding more and more out of their drinkware – more capacity! more quality! more features! Brands such as YETI, S’well, Thermos, Tervis, and Nalgene are prominent in the drinkware industry because they have mastered the needs of their consumers. Putting your logo on these retail brands is an investment – with all of the "more"s comes a higher price point – and for many, a worthwhile one. A branded YETI tumbler carries a high perceived value that is as much gift as it is marketing piece. But not every company wants to spend brand-name money for brand-name products. For those companies on a budget, some of the manufacturers we work with have created more affordable versions with many of the features that consumers love about the retail brands. These are not cheap knock-offs, either – they're quality drinkware products made from quality materials that carry a cachet of their own. Here are five examples of promotional drinkware pieces that are comparable — if not better — than the name brands. The YETI brand has exploded into the market as a forever fan favorite for superior drinkware. The brand has not only become the leader in drinkware for the rugged/outdoor market — hunters and fisherman — but lately they've become known as a high-end luxury brand, while retaining their outdoorsy roots. A great alternative to the YETI is a customized Himalayan tumbler, which provides the copper vacuum insulation and stainless steel strength of a YETI, and is the perfect choice for both hot and cold beverages. The snap-on, spill-resistant thumb-slide lid is a great feature for people on-the-go. The fun colors that are offered in the powder coat finish are also reflective of YETI’s famous appearance. The Himalayan is the perfect quality piece of drinkware that will never disappoint. In addition to branding on one side or a full wrap, the Two-Tone Himalayan Tumbler can also be customized with a full color packaged box, which means more branding real estate! This is a great tool to use if you are looking to go one step further with the way you present a quality drinkware piece to your customers. Unless you live under a rock, you have most likely seen a S’well bottle. Maybe you have one...or five. Why are people still hyped about this bottle? Maybe it's the easy-to-hold shape. Maybe it's the solid stainless steel insulating qualities. Maybe it's the wide variety of colors and patterns that are perfectly on-trend. Whatever the reason, people, and companies, think they're, um, S'well. Our selected alternative, the h2go force, comes in iridescent colors that mimic the numerous colors and patterns of the S’well bottle. The h2go force is offered in a number of sizes – choose from 17 oz., 26 oz., or 34 oz. to fit your needs. Perhaps your customers want the smaller 17 oz. bottle so it fits into their purse or backpack but they want the 34 oz. bottle for camping trips to hold more beverage, whether that be water or wine (we won't judge). 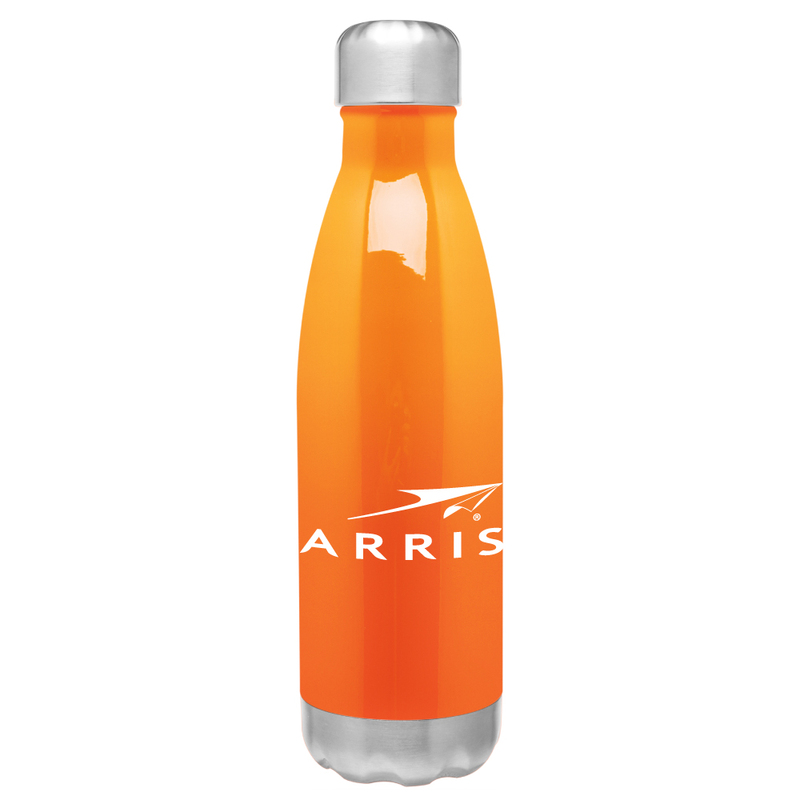 ARRIS Group Inc. provided these bottles as a gift to the interns at the end of the ARRIS Internship Program. They wanted a drinkware piece that was affordable, low minimum order quantity and a quick turn time. They were so pleased with the quality that of the item that a second order was placed only two months later. A huge player in the travel mug industry is of course, Contigo – simple, sleek, and spillproof. The Punch tumbler mimics the Contigo style and is perfect for the on-the-go fashion-forward consumer. The Punch tumbler is easy to hold and drink while also fitting perfectly into a cup holder. Whether you are an iced coffee person or if you prefer the traditional hot coffee in the mornings, the tumbler will keep your drink hot or cold with the double wall construction for insulation. Thanks to the snap-on sip through lid, no more worrying about spills on your lap! 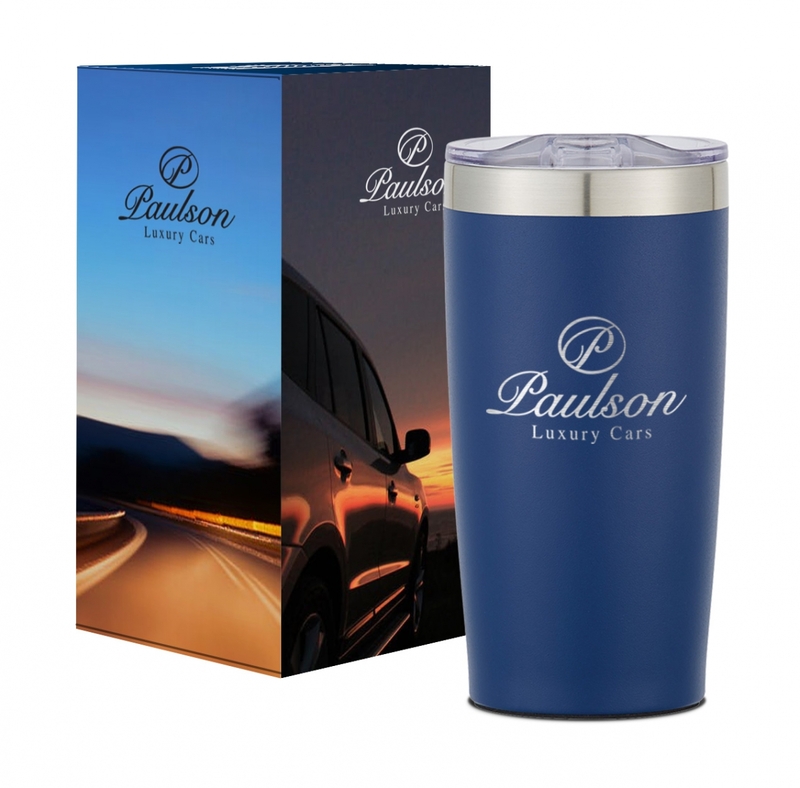 If you want to travel smart and in-style, the Punch tumbler is your cup of tea...or coffee! 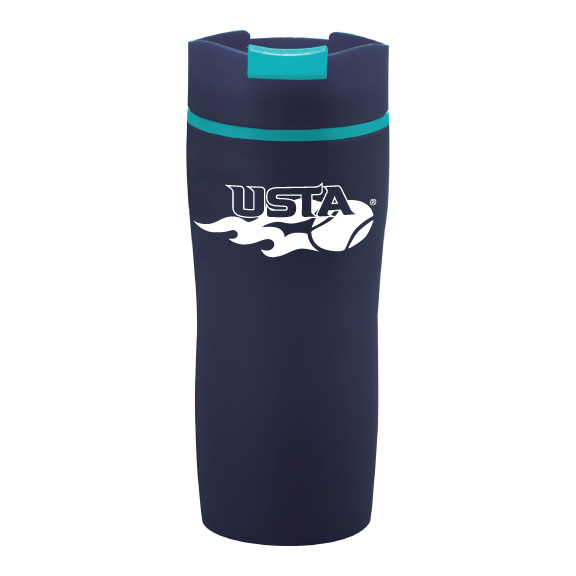 Our tennis division, Netknacks, offered these travel tumblers on their website and they became a huge hit (get it??)! The customers loved being able to use them for a variety of reasons, whether it was the early morning match over the weekend or morning-commute coffee during the week. Let’s face it – it isn’t easy to find a drinkware piece that's attractive to all ages, but the Tervis Tumbler is definitely an exception. Its impact- and shatter-resistance and double wall construction to hold and cold liquids makes it indestructible whether you are a child, teenager or adult! The customized Tritan tumbler is a perfect lower-priced alternative with its optional snap on lid and 9” straw, making it the perfect sippable giveaway. The Tritan tumbler is also known for the unique customization capabilities where the decoration is inserted in between the clear double walls of the tumbler and sealed to provide insulation. You can put your logo on an embroidered round patch, screenprint on a white or silver full wrap insert, or customize on an oval dome. This USA made product is a true American classic. Whether consumers are planning a picnic, mountain climbing, cycling, or just need a new water bottle for their kid to use in grade school, Nalgene is the go-to pick because it is easy to handle. The promotional h2go wide tumbler offers the same lid retaining loop of a Nalgene for anyone who is on-the-go. For all the parents out there, this water bottle design is perfect for cleaning due to the wide neck so say goodbye to those terrible odors. And for all the non-adults out there, the h2go wide becomes a canvas to put your own personality on. This large and in-charge (34 ounces to be exact) drinkware piece is a great choice due to its convenience and durability. In fact, all 52 regions of Teach for America use the h2go wide for recruitment through the year. They are clearly experts in understanding their target market! 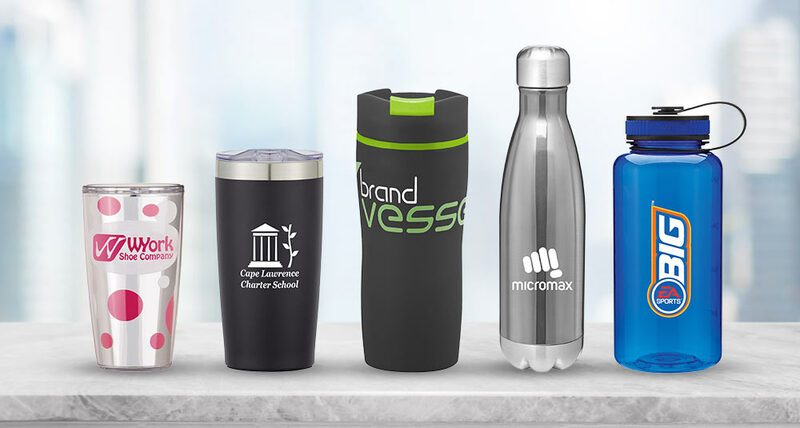 If you are looking to leave a lasting impression without breaking the bank, these promotional drinkware pieces are perfect giveaways and corporate gifts. These quality promotional items take all of the best features of popular name brand drinkware and deliver them in a more affordable way...everybody wins!